I remember having a conversation with my parents talking about plants in Laos. I was always curious to know the English equivalent names. In some cases I knew. In other cases, I did not. Although there are handful of books on plants in Laos (or more generally of Southeast Asia), this particular book is one of the first and only few that I've been able to find that includes a long list of plants in both Lao and English translations. I found this document back in 2004 in a bookstore in Vientiane. I say document because that's how it was being sold then, not so much as a book. Great thing is, it's been updated and republished in 2008 and 2011, in book format. And it's also available online and of course it's quite detailed. 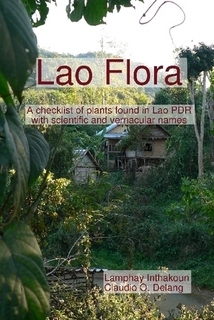 For that reason I have to recommend it as a great resource, at the very least, for trying to find out the names of all those Lao plants you hear old Lao people talk about! It essentially includes every group of Lao plants you can think of (plants, trees, vegetation, flowers, medicinal plants, herbs, utilitarian plants, bamboo, rattan, etc.). The authors also encourage feedback, comments and corrections. Happy Lao New Year 2555!